The outcome of the confrontation between moderate and radical Islamists will influence the future not only of the Middle East, but of the rest of the world. Vladimir Snegirev of Rossiyskaya Gazeta sat down with former prime minister and Middle East expert Yevgeny Primakov to discuss the situation. Rossiyskaya Gazeta: Let us talk about Syria first. All the signs are that the situation there is becoming more and more alarming. There are early signs of panic in the capital, something that was not the case only three or four months ago. What are your thoughts on all this? 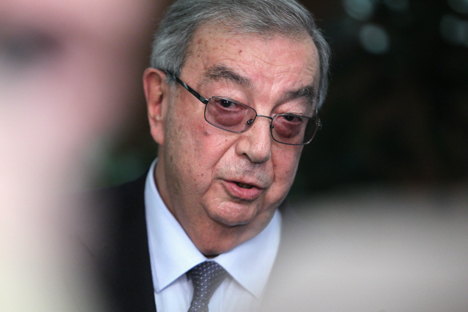 Yevgeny Primakov:A full-scale civil war with the participation of external forces is being fought in Syria. There are all sorts of mercenaries and volunteers from other countries fighting against the regime alongside the Syrians. The latest report says that President Obama has issued a direct command to the CIA to back the Syrian opposition. That is gross interference in the internal affairs of a sovereign state that poses no threat whatsoever to the United States, or to anybody else. Saudi Arabia and Qatar are financing the militants. Turkey is actively supporting them. RG: Everybody is gazing into their crystal ball wondering what will happen if the Bashar Assad regime falls. Will supporters of the current president become victims of bloody terror? Russia describes the situation in Syria as "the state of emergency or military conflict"
Y.P. : If the armed opposition succeeds in toppling Assad, an attempt will be made to install a Sunni regime in Damascus. This will automatically lead to persecution of the Alawites, who constitute a significant part of the population. Contrary to what some people think, it’s not only activists of the ruling Ba’ath Party that will be persecuted, but all those who do not share the opposition’s beliefs. R.G. : The war in Syria represents a continuation of the processes called the Arab Spring. For you as an Arab scholar, did all these revolutions come as a surprise? Y.P. : Yes, it was a total surprise. And not only for me, but for everyone: for the Americans, Europeans and the Arabs themselves… Demonstrations can happen almost anywhere. A government coup was expected in some places. But it never occurred to anyone that such a wave would sweep the whole region. R.G. : Many were taken aback by the sweeping success of the Islamic radicals who seized control in Tunisia and Egypt, more so because they seemed to do it in such a democratic fashion. Doesn’t radicalization of a vast and strategically important region give cause to some fears? Y.P. : In my opinion, it would be wrong to claim that the strengthening of radical Islamists has been the main result of these revolutions. The Muslim Brotherhood in Egypt is a fairly moderate organization. The Syrian Brotherhood is more aggressive. What we need to keep an eye on in Egypt right now is how relationships between the Muslim Brotherhood and ultra-radical Salafites develop. That is, the relations between the Freedom and Justice Party [which would have held roughly 50 percent of the seats in parliament, had the elections not been annulled by the Constitutional Court and parliament abolished] and the Light Party [which would have held nearly 30 percent of the seats]. The recently elected Egyptian President, Mohamed Morsi, has announced that he is resigning from the Muslim Brotherhood and promised to become “the father of all Egyptians.” His recent statements and actions in the area of foreign and domestic policy give grounds for hoping that Egypt will remain a secular state. The Salafites are categorically in favor of a state governed by Sharia law. R.G. : The Taliban in Afghanistan, the Salafites in Egypt, the Wahhabites in the North Caucasus… How do you account for the growing popularity of extremist Islamic movements? Y.P: Yes, the Islamic world is not homogenous, there are those who preach moderate Islam, and there are radicals. Of course, much will depend on the outcome of the confrontation between these two trends. And the outcome will influence not only the future of the Middle East, but also that of the rest of the world. R.G. : What do you think about the theory that the turbulent Arab Spring process has American hands all over it? Y.P. : This is just ridiculous. Egyptian President Hosni Mubarak suited the Americans very much and, incidentally, the Russians too. One should not demonize the Americans. If they can be reproached for anything, it is for their poor grasp of the real situation on the ground. When the changes in Egypt happened, American ambassadors to Arab countries gathered for a meeting in Washington and [U.S. Secretary of State] Hillary Clinton gave them a dressing down, accusing them of writing their reports without leaving their embassy offices. Your reports are one thing and the reality is something quite different, she said. R.G. : How do you see the future of the revolutionary processes in the region? Y.P. :: I don’ think there will be any more revolutionary waves in the near future. R.G. : What is the probability of Israel, with or without U.S. support, launching a strike on Iran’s nuclear facilities? Y.P. : The U.S. does not want it to happen in the run-up to the presidential elections. It is restraining Israel. But one has to bear in mind that there are different forces and different positions within the Israeli leadership and the U.S. administration. It is hard to say who will gain the upper hand. R.G. : In other words, such a strike is possible. Does it pose a danger for the whole vast region? Y.P. : A very big danger, whereas the results of an air strike – there is no question of a land operation – may have little effect. Iran would fully recover in a couple of years, demonstratively withdraw from the treaty on the non-proliferation of weapons of mass destruction, and then definitely create its own weapons of mass destruction. The article was abridged and first published in Russian in Rossiyskaya Gazeta.